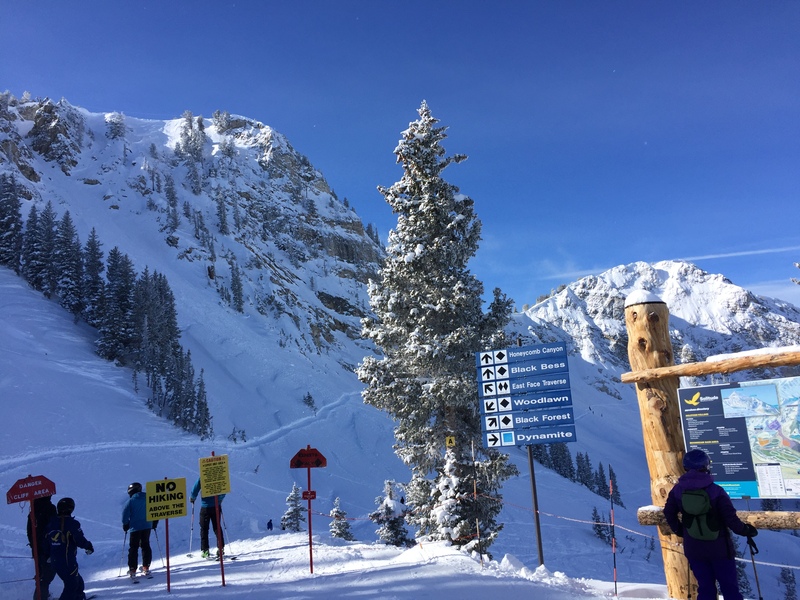 TLDR: Wednesday’s storm will bring light to moderate snowfall to Wasatch resorts. Scroll down for the timing and specific accumulations. For those of you that missed the MLK day powder rush, Tuesday’s bluebird ski offered plenty of fresh turns. I had a chance to squeeze in a few runs at Solitude and needless to say it was well worth the trip up the canyon. With MLK Day storm totals under the belt, let’s talk about what we can look for this week. First, Wednesday morning is the next chance to see accumulating snow in the mountains. As Taylor alluded to yesterday, this disturbance is a weak nudge and relates to a shallow shortwave trough. Furthermore, I can summarize the Synoptics of this system pretty easily. In the mid-latitude cool season, troughs are often just a way of looking at a dip in the jet stream. These dips contain by nature a certain amount of spin, specifically “vorticity.” In essence, both the concentration of vorticity in an area, along with this area’s direction of travel, can suggest the strength and location of a disturbance. Take tomorrow’s storm for example. 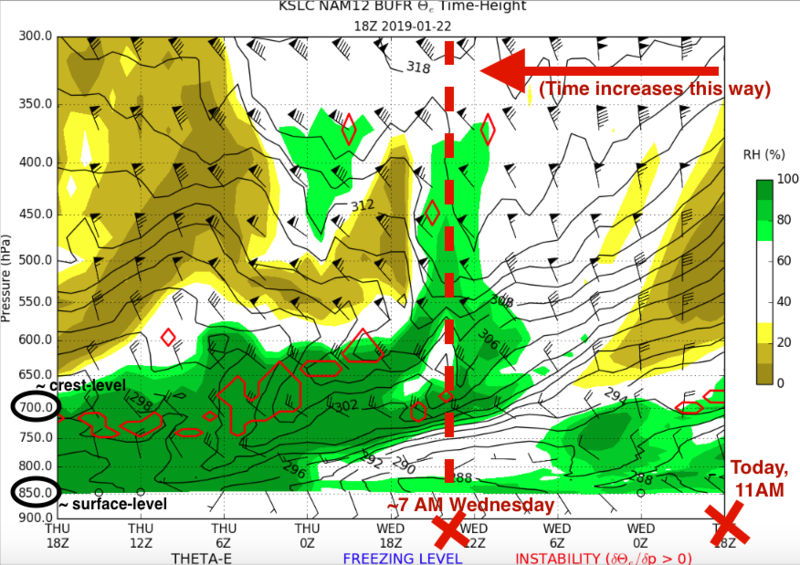 To start, we can observe Wednesday’s passing shortwave trough as a moving area of moderately strong vorticity (shaded below) in the middle troposphere (about 19,000 feet ASL). Next, this area of vorticity is headed towards the southeast as indicated by wind barbs. 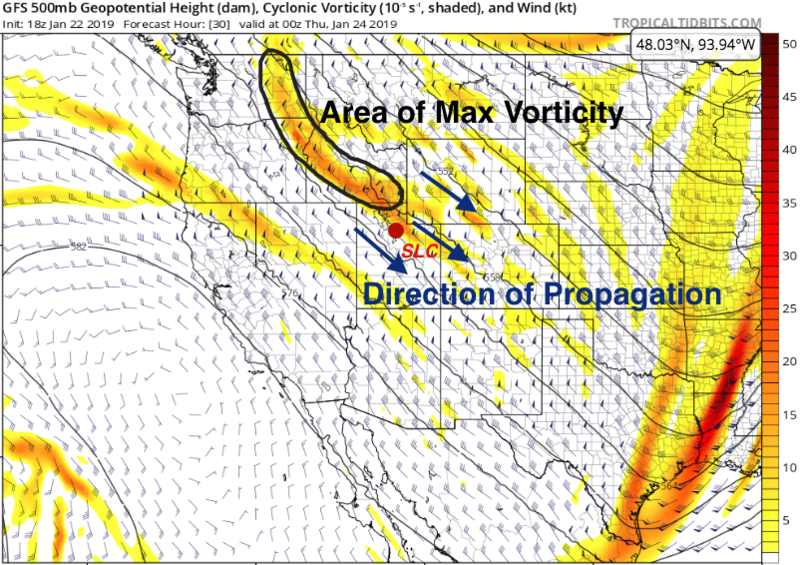 Finally, meteorology would place the disturbance where vorticity increases maximally. That’s just downstream of the area of vorticity (outlined in the figure) for the time stamped in the image, or just over northern Utah. With this information alone we can assume that something could happen over northern Utah, and it’ll probably be weak. From another perspective, we can see this weak front in the time heights below. Specifically, Wednesday morning’s front is accompanied by increasing temperatures, moisture, and instability. Furthermore, it passes aloft (around 7 AM Wednesday) before it crosses the surface. Altogether, this is a pretty typical warm front signature. Also, note that the front will be most potent in the 750-700mb range, or between about 8,000—10,000 feet, as indicated by a tight temperature gradient. In general, snowfall begins light with the frontal passage, hitting the northern Wasatch first. Then, snow rates increase throughout the day Wednesday. At least one more storm is slated to hit the region this week. For a better perspective, we can zoom out from the first 500mb plot I showed. 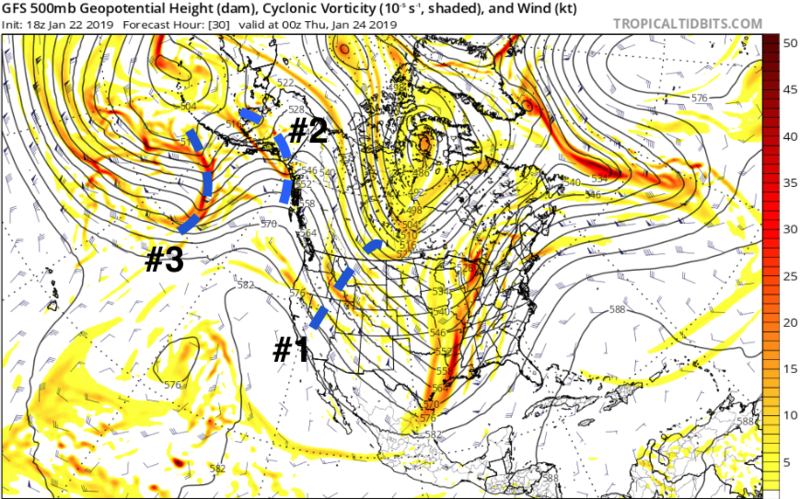 Note that Wednesday’s storm is marked by #1 and a blue dashed line over its trough axis. Also, we can observe two other troughs spinning around a stationary gyre over the northern Pacific. The GFS model stretches #2 as the system passes east of us and poses no threat. Next, the North Pacific gyre kicks #3 downstream sometime Friday, and the storm passes just south of UT. However, even if models push this last storm’s track northward, #3 may be too dry to deliver much or any precipitation. Looking ahead, I think this weekend we’ll have a weak inversion, with moderately unhealthy air quality in urban areas. Then, the next best chance for sizeable resort precipitation is around Tuesday next week. Nevertheless, check future posts for more comments on Friday’s chances for snow, inversion possibilities and strength, and the next best chance for a storm.